Hillary Chybinski: birthday party - check. . .
birthday party - check. 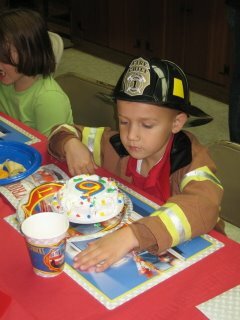 . .
. . .we had ryan's 6th birthday party on saturday. . .at the firestation. . .for the 4th year in a row. he loved it - i think the kids had a great time. . .but i have to say, I'm glad it's over. i feel like i can concentrate on the baby now - without interfering on ryan's turf. not to mention all the other things i need to get caught up on - scrapbooking for one. i'm way behind on 2 circle journals that i need to do. . .luckily the other women understand and have been very gracious. so happy birthday my sweet boy - i hope the memories we make for you last a lifetime - that they make you as happy as you make us with your sunny smile and infectious laugh. having you in my life has changed me in more profound ways than i could ever explain, and i love you beyond anything i could express. hope you enjoyed turning 6. mommy and daddy love you!